Peterhead were the bookmakers favourites to win this match and after Ryan Dow put the visitors ahead in the 29th minute Annan had a job on their hands to turn it around. Peterhead’s big players done the damage and were the difference between the teams, Rory McAllister added a superb 79th minute goal which almost put the match out of reach before Tony Wallace gave Annan late hope when he headed home in the 82nd minute but Jason Brown made the most of a goalkeeping error by John Jamieson in the 86th minute to secure the points for the visitors. It was a glorious day with Peterhead electing to play with the stiff wind blowing up the park, Annan started very well and were causing problems especially down the right with Sinnamon and Johnston combining on numerous occasions to test the Peterhead defence with Greg Fleming the busiest keeper in the opening 20 minutes. Johnston was a constant threat down the right and in the 25th minute his cross to the back post almost unlocked the Peterhead defence. Then against the run of play at that stage of the game Peterhead struck. The move was created down the right and ended with Patrick Boyle sending in a low cross and Ryan Dow managed to get the vital touch under pressure from Scott Hooper to direct the ball into the corner of the net. It was a hard blow for Annan to take and it was the only goal which separated the teams at half time. Peterhead started the second half on the attack and Ryan Dow blasted over the bar from 8 yards, this was followed by a McAllister effort which failed to test Jamieson in the Annan goal. Tommy Muir appeared to be harshly booked in the 55th minute but in the 65th minute the Annan striker was replaced by Ross Ferguson and within minutes Ferguson got his head to a Ryan Sinnamon free kick. Annan were enjoying a good spell in the game and in the 77th minute they had a glorious opportunity to square the match after Roberts and Ferguson both had clear cut opportunities to hit the target. Peterhead then struck again in the 79th minute. Ryan Dow once again had the hand in the goal after Jamieson pulled off a good save to deny the striker’s 20 yard effort but the danger was not over and as the Annan defence cleared the ball, Rory McCallister struck a stunning 30 yarder which left Jamieson routed to the spot. Annan were in trouble but Tony Wallace gave them late hope when he headed home Aidan Smiths cross ball from close range in the 82nd minute. Annan’s hopes of pulling the game out of the bag were diminished only 3 minutes later after, Peterhead won a corner kick and from the resulting corner keeper John Jamieson could only parry the ball to the feet of Jason Brown who made the best of the situation to prod the ball over the line from close range. Peterhead –Greig Fleming, Jason Brown, Patrick Boyle, Russell McLean ( Ross Kavanagh 75 min ), Michael Dunlop ( Cameron Gadie 80 min), Ryan Dow, Jamie Stevenson, Scott Brown, Rory McCallister ( Derek Lyle 80 min), Jack Leitch, Willie Gibson. Subs not used Ryan Gibson GK, Callum Home, Simon Ferrie, David McCracken. Referee – Alan Newlands, Assistants – Drew Kirkland and Colin Whyte. In the other SPFL2 matches Edinburgh City maintained their impressive form at the top of the league with a 1-0 victory courtesy of a Conrad Ballantoni second half goal over Cowdenbeath. Berwick were leading Clyde by 2 goals to nil but Clyde hauled themselves back into contention to seal the match in the second minute of injury time through Abdelkarime Belhoktmar. Elgin City lifted the points with a 2-1 home victory courtesy of an 88th minute Shane Sutherland winner over Queens Park who went in front through an early first half goal. The result of the day however was Albion Rovers first win of the season with a 3-0 home victory over Stirling Albion. Albion Rovers travel to Galabank next Saturday on the back of 3 decent results a 1-0 defeat at Clyde a 1-1 draw at Cowdenbeath and a 3-0 victory over Stirling Albion. 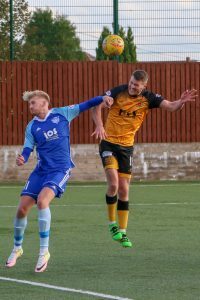 Victory for Annan would put them into a reasonable position at the end of the first Quarter Results. Stirling Albion have parted company with their manager Dave Mackay who has been on charge for over two years.